The divergence between silver and gold continued yesterday with silver trading marginally higher during the session, whilst gold price fell slightly, but the commodities market in general is trading sideways on thin trading volumes, and a lack of fundamental news as we approach the end of the summer season and hopefully see some momentum injected into the markets as we enter a new month. 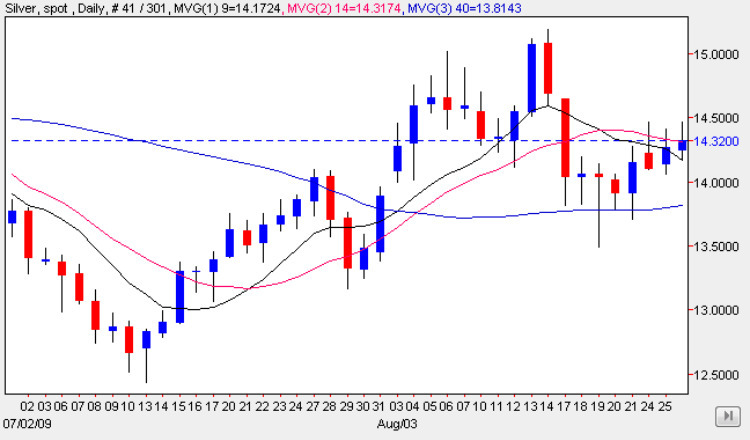 Yesterday’s candle on the silver chart was weak, ending the silver trading session as a small shooting star candle which once again tested the $14.50 per ounce level, only to fail once again and closed the trading session just below the 14 day moving average. Once again we have a bearish signal, with yesterday’s candle making this the third weak candle for the week so far, and with all three failing to breach the above level, it seems that it is only a matter of time before we see a fall in prices on the silver chart. Any move lower may only be a temporary one, as we have some solid support below, but should we see a breach of the $14 per ounce level, coupled with a break below all three moving averages then this could signal a deeper move in due course. My trading suggestion for today therefore is to look for small short positions on an intra day basis with small profit targets.